Campeche feels a world away from the hustle and bustle of Cancun and Tulum. As our taxi pulled into the the walled, historic old town, designated a UNESCO World Heritage site in 1999, we had flashbacks to Georgetown and Melaka, two of our favourite cities in Malaysia. The narrow cobblestone streets were lined with colourful mansions, and many of the streets were closed to traffic, making for a very pedestrian friendly part of town. Our hotel was super cute, and the helpful staff checked us in before we headed out for lunch. We opted for a break from Mexican food, which turned out to be a bit of a mistake. Lunch was an average affair, but at least it was in a nice setting. As we wandered back to the accommodation to make a plan for our time in Campeche, the heavens opened, as seemed to be common during our time in Mexico during monsoon season. The town clearly wasn't designed for this much rain - the gutters were overflowing, the streets were flooding, and our accommodation stuffed towels under our door to stop the rain from the patio from pouring into our room! Luckily, by dinner time, the rain has gone, and we walked down to the main square to a restaurant called Maria's Cocina. Dinner made up for lunch, and we enjoyed delicious meals, a spot of dessert, and Zev even got himself a michelada. We enjoyed a pleasant stroll home with the whole old town lit up. 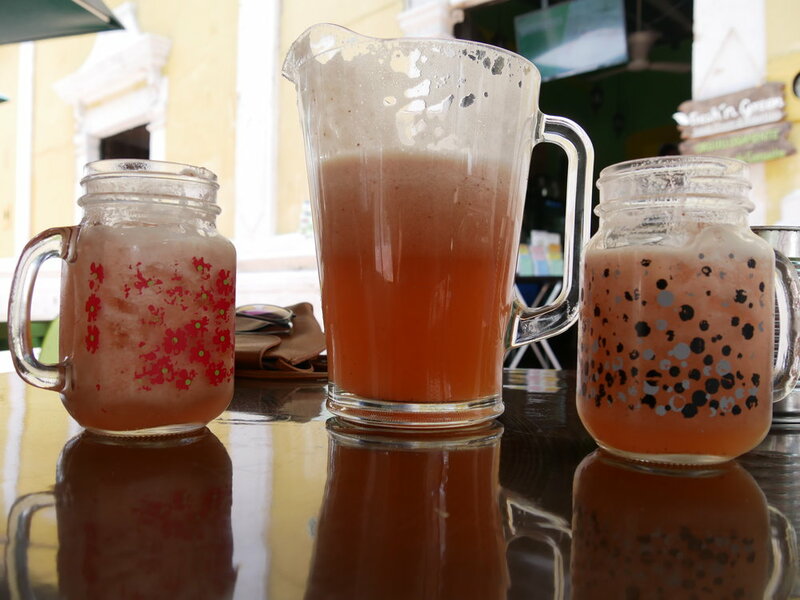 With only a day to spend in Campeche, we made the most of it! After breakfast at the accommodation, and a quick stop to buy onward bus tickets, we started our tour. Although no longer functioning as a church, this former church has retained it's stunning facade. When we visited, it appeared to be under construction, so hopefully they're in the process of restoring it. Housed inside is a small craft market, but the interior of the church has largely fallen into disrepair. This is one of the many gates into the walled city. This provided entrance from the water. In modern times, land along the waterfront has been reclaimed, so now the waterfront is a few blocks from the gate. The central square in Campeche was stunning, filled with carob trees and park benches, and surrounded by picturesque colonial buildings. Lots of locals were passing through the square, and we sat on a bench and people watched for a while. Casa Numero 6 was a pre-revolutionary era mansion, owned by a Spanish family. Parts of the house are open to the public, and contain examples of furnishings from the era. 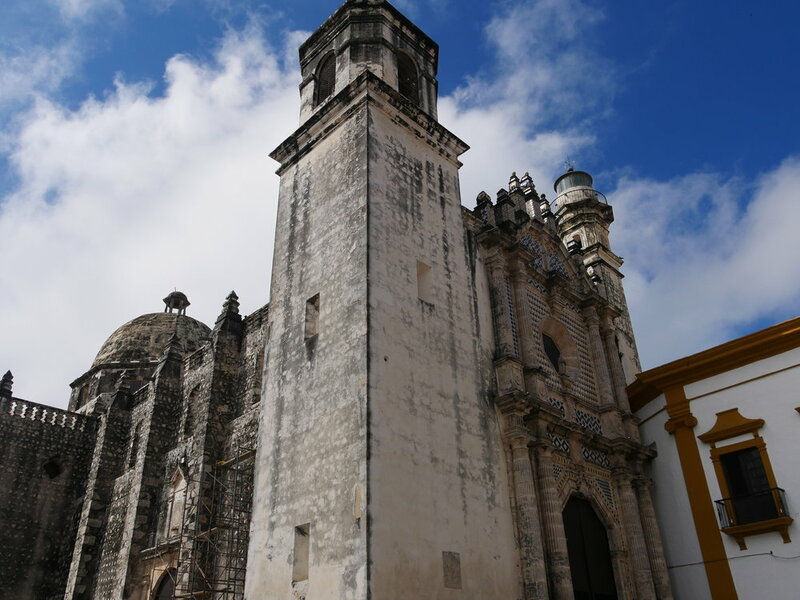 Campeche Cathedral is a baroque style building, with an impressive facade overlooking the main square. Our next stop was the excellent Museo de la Ciudad, covering the history of the city. The city was founded in 1540 by Spanish conquistadores, after they 'discovered' the Maya city of Can Pech. Over the next century, Campeche was terrorised by pirates, so in 1686, the Spanish began fortifying the city. The original fortified city is now the UNESCO World Heritage Site. After a quick stop for ice cream, we spent a little time wandering the small but lovely botanic gardens, which was also walled in, mimicking that of the old city. In addition to a variety of interesting Mayan artifacts, the museum offers access to the top of the ramparts. The view from the top was amazing! After stopping for a late lunch, we headed back to the accommodation to escape the predictable afternoon rainstorm. In the evening, when the rain had abated a little, we headed down to the modern day waterfront for a stroll. The moody storm clouds and impressive storm in the distance made for a pretty cool backdrop, but we didn't stay long before the rain drove us back to shelter. Dinner was average, but we stopped for some hot chocolates and a chocolate tamale for dessert. The walk home through the streets at night was a nice way to say goodbye to this cute little city!